For the last two weeks the great spotted woodpeckers have been “drumming” away in the birch/rowan woodland above and below the house. Drumming means hammering away at bark with their short but powerful beaks, either as a form of display or to find food. My thoughts went to what sort of breeding season they might have this year as last year it was the worst that we can recall in the last 30 years we have been living in this strath. I still had not worked out why last year was so bad for them but by chance I read a note from the British Trust for Ornithology about the decline in sparrowhawks last year. Apparently the very poor season for small birds came about because of wet weather and poor insect supply. This affected sparrowhawks because, particularly the smaller males, rely on such small birds for the bulk of their food. So could this be the underlying cause of the woodpeckers problems last year? Looking at my wildlife notebooks last year there were problems with the starlings in the doocot in the garden. Normally what happens is that the first brood of chicks come off just in time for the woodpeckers to take all the chicks just before they have fledged. However the starlings have another brood that is normally successful. This year it was almost as if the starlings knew there would be food problems later in the summer so they laid early and the first brood were off before the woodpeckers had fledged. Then the starlings just gave up for this year. On the small bird front the siskins had a very good year but they are early breeding birds and it was not long before their first chicks had fledged and were eager to get at the nyger feeders. Then it seemed as though the number of small fledglings decreased compared with previous years. But how reliant are great spotted woodpeckers on small birds? Certainly they will freely take small birds out of nestboxes and any of us who have put up small boxes for titmice will know the values of putting a metal plate around the entrance hole. The woodpeckers are a lot cleverer than that as even if you put a plate on the bird will register the chicks are in there and just hack their way in. However they do it is in the same way as they find grubs of insects. 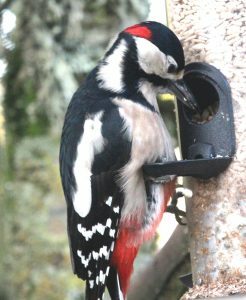 They hammer at the bark or nestbox and whatever is inside may make a slight noise and it is enough to alert the woodpecker. So this formidable beak of the woodpecker has a number of purposes. It can dig out food such as chicks and grubs, and it can be used as display or contact calls. A unique feature is that it can be used to make an anvil on which nuts etc. can be placed to break open. As an indication of the wide range of uses then just look at the garden. Do you know of any other bird that will take such a wide variety of food? They will freely tackle peanuts, mixed seed, bread and to see how they tackle suet balls is a revelation. I remember the amazement when I watched a woodpecker demolish a whole apple that had fallen onto the ground. Its stiff tail may be advantageous to climb bark but to see it used on the ground as a prop is almost amusing.